The Sports facilities provided in the Club are of International Standard. It is ‘A’ Class Swimming Pool and is built on an International Standard with top quality materials such as Bissaza tiles from Italy, Lighting Equipment from Spain, etc, Landscaping and wall cladding of the pool are done with utmost care and commitment. The Filtration Equipments are imported from Spain is installed in the Swimming Pool to provide crystal clear water to the pool. It will be a great pleasure to use this Swimming Pool. It is being supervised by an expert Swimming Coach. Evening Session: 4 P.M. to 6.00 P.M. The Courts are towards eastern side of Club House Building. There aretwo well maintained Synthetic Tennis Courts with floodlit facility and surrounded by beautiful landscaping area. The players are provided with locker and change room. Tennis Coaching Classes are conducted regularly for the benefit of Members with the help of well trained coaches. Morning Session: 6.30 A.M. to 11 A.M.
Floodlight : 7 P.M. to 9 P.M. Coaching Time: 4 P.M. to 6 P.M. The Club has 2 Indoor Shuttle Courts made up of wooden floorings with daylight illumination. Players are provided with lockers and change room. With the well trained staff, regular Shuttle Coaching Classes are being conducted for the benefit of children of Members. Evening Session: 6.30 P.M. to 10 P.M. Coaching Time: 3 P.M. to 6.30 P.M.
Cards sectionis located in the 3rd floor of Club House Building. 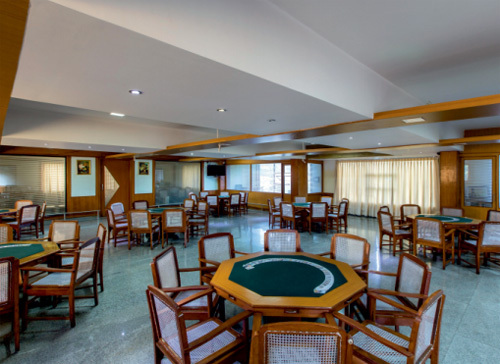 It is one of the best Cards Hall along with a Special Cards Room both with centrally Air Conditioned. A cozy atmosphere is created by best Interiors. There are 15 tables which are used by Members and their family regularly. The play timings are 11.00 A.M. to 11.00 P.M.
Health Club is well equipped with top quality Physical Fitness Equipment imported from USA to be on line with other leading Clubs. There are 16 Life Fitness imported Treadmills along with Multi Gym Equipments, Cross Bars, Cycling Equipments, Slimming Equipments, Weights, etc. This is considered as the best Health Club in the city of Bangalore. It is one of the Sports sections being extensively used by our Members. Evening Session: 4 P.M. to 10 P.M.
A separate yoga centre with an expert yoga teacher is provided for the benefit of the Club Members just by the side of the Health Club. Practice time is of one hour duration daily. A spacious Billiards Room with central A.C. located in the 2nd Floor at Annex Building. It has 3 Imported Billiards Tables with adequate illumination and 2 pool tables. The Billiards Room is designed to the International Standard with adequate seating arrangements. Morning Session: 11.30 A.M. to 1.30 P.M.
Evening Session: 3 P.M. to 10 P.M.